Highland Lakes, a section of Vernon Township, is in the northwest corridor of New Jersey on the eastern side of Sussex County. Highland Lakes is a private club and community association offering 5 lakes, a clubhouse, tennis courts, many beaches, ballfields, utility fields and more activities than you can imagine. It is located in Vernon Township party of Sussex County. Two of NJ’s major ski areas are in Vernon and just minutes from Highland Lakes. Many golf courses h ...Learn more here! Highland Lakes is a private club and community association offering 5 lakes, a clubhouse, tennis courts, many beaches, ballfields, utility fields and more activities than you can imagine. It is located in Vernon Township party of Sussex County. Two of NJ’s major ski areas are in Vernon and just minutes from Highland Lakes. Many golf courses have been constructed in recent years also minutes from this community. The Appalachian Trail runs through Vernon in Wawayanda State Park – also minutes away from Highland Lakes. It is truly a 4 season recreational area. Year round residents generally commute to work within a 40-50 mile radius. Since the community is only about 50 miles from Manhattan, many enjoy a second home here for weekends and summers. Members must be residents and residents need stickers and badges to participate in activities or to park in community. Mandatory annual dues are $960 (2006) with an initiation fee currently $1,000 and will be $2,000 as of October 2006. Taxes in the area are in the $3500-10,000 range. Real estate is in the $200,000-700,000 range. There are five lakes in Highland Lakes; four are small and the main lake is 3 miles with about 4 or 5 islands to explore. Only lakefront properties have private docks. There are many other docks to use around the lake. 50% of residents are year-round. The nearest airport is Newark International which is 50+/- miles away. The nearest hospital is 10-15 miles away. The nearest major cities are Wayne, Rockaway or Newton all about 20 miles away. Warwick, NY is just about 7 miles away. The main lake is about 325-350 acres and 4.5 miles around. 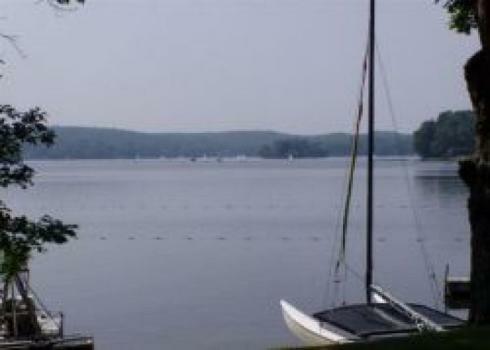 Most sailing activity and all swim races occur on the main lake. Swimming, boating and fishing occur on all of the lakes. Only electric motor boats are permitted. No gas engines. Lakefront owners usually keep their boats in their own yards. There is a lottery each year permitting members to store boats on community docks. Sailboats get first pick of dock space. There are also freeways to the lake where members can store kayaks, canoes and rowboats. All activities and amenities are available for all residents in the community equally. The beaches are guarded during the swim season. No dogs are permitted on the beaches. While some residents enjoy the privacy and seclusion of their homes or “weekend getaway in the country, others enjoy participating in community events. Volunteerism is big in Highland Lakes. It is a great way to meet your neighbors and it is truly what makes Highland Lakes so special. If your interest is fishing – you can join the fishing committee and help monitor what fish get stocked in the lake. If your interest is music, you can join the monthly Lakeside Café where neighbors meet neighbors and entertain one another. There are softball teams, swim lessons and races, sailboat racing (sunfish, comet, force five and wind sailing teams). Each week they meet and have some fun and make some memories. The main lake is filled with beautiful sails between 10 and 3 every Sunday during season. There are dinners, holiday parties, and too many activities to mention for “the young and young at heart”. If your favorite activity is not on the list, come start it! Water Level: Average water level variance? The lakes have had new dams and spillways in the past 10 years so water level variance is regulated. Boat Docks: Are they permitted? Yes, only lakefront properties have private docks. Power Boats: Are they permitted? Yes. Electric engines only. Only electric motor boats are permitted. No gas engines. Lakefront owners usually keep their boats in their own yards. There is a lottery each year permitting members to store boats on community docks. Sailboats get first pick of dock space. There are also freeways to the lake where members can store kayaks, canoes and rowboats.